Whether you support customers, employees or do some teaching on line, your need a real-time web-based remote support tool which can assistant you to show your method more clearly and easily. Just word explaining will be a little difficult for you to show your ideas clearly, now you need some tool which can make online screenshot sharing and edit images. 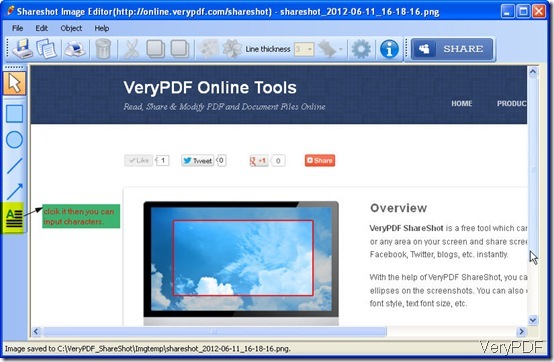 VeryPDF ShareShot is such one. ShareShot has the ability to increase efficiency dramatically and lower support costs. When you some problem can not be cleared easily, maybe you need face to face talk or make a phone call. If you need to make intercultural communication, the cost will be very high. However, if you share your ideas by illustrating based on images and word, the cost will be lowered. Now let us check to to use it? This software is a free ware which was developed by VeryPDF aiming to provide more convenient and fast service to their old customer friends. With it, online screenshot sharing is as easy as ABC. Three seconds to figure it out. Download it successfully, there will be an icon like a pencil. Double click it then you can use it. No software interface but showed in the right corner of the screen . Choose setting options according to your needs. 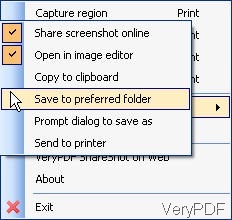 Say if you need to share screenshot online, please choose it. This software also can give you real camera effect through making camera sounds and show the flashlight. If you need to edit image before sharing, please choose Open in image editor. Situation: I need to show our clients how to use this software to make online screenshot sharing. His question is that he does not know how to add words on images. Here, I will call an end to introduce ways of online screenshot sharing. If you have any question, you can contact us by the ways supported on this website. 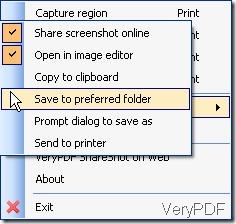 Can I delete the pictures of my PDF file and convert only text to PPT? How can I print a RTF document from Windows WordPad to text file by PDFcamp Printer?